It’s 1949. The City of Los Angeles is under the reign of terror brought about by Mickey Cohen, a brutal gangster who thinks himself as “the future”. As many other gangsters, Mickey has bought out cops, politicians and judges, so he is virtually untouchable, or so he thinks, until the chief of police gives a former war vet now a detective with L.A. police the go ahead to form an independent force to weed out Mickey Cohen and his empire. 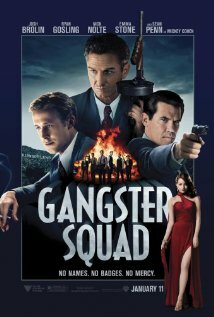 Several misfit policemen join the task force which is informally called “gangster squad”, and they somewhat erase the line between good and evil in their efforts to bring Mickey Cohen to justice. I thought this was an OK movie, but no more than that particularly because the story resembled way too much The Untouchables, which is movie legend by way of its cast, musical score, direction and everything you can think of that makes a movie great. Gangster Squad was not so. As I said, this film paled in comparison with the other one in more ways than one. Don’t get me wrong, I liked the performances, I just wasn’t moved. Once again The Untouchables did it first and much better. Why repeat the recipe if you’re not going to improve it? The cast is impressive though. Sean Penn, Josh Brolin, Ryan Gosling, Emma Stone, Anthony Mackie, Michael Pena and Nick Nolte co-star. In summary, instead of watching Gangster Squad go see The Untouchables and you’ll get better use of your time.